I'm Blathering Now... (Tea, Tom & No Time to Blog! ): Happy New Year! Well now seems like a fun time to review the year that has passed me by in the blink of an eye! But before I do that, a little catch up on what I've been up to in the past few days. Well of course we had Christmas Day! For the first time ever I went to a pub on Christmas Day. It was brilliant, no preparing food, cooking food, arguments on the lack of help being afforded to me, no washing up, no arguing about lack of help on the washing up front... no just plonk bum down, be sociable for a couple of hours, even I can do that, and then home to spend the rest of the day in my pyjama's...with my new pencil set...and a rather gorgeous photo from the new BBC epic War & Peace. The next few days were interspersed with catching up on TV, the entire series of Jeckyll and Hyde, Harry Price Ghosthunter (very good - get it on catch up if you can) reading and catching up with friends. I was watching the recording of The Winter's Tale on Tuesday, so as I didn't have a clue what it was about (I hold my hands up I've not read everything by Shakespeare...yet) I thought I'd better read it! (My friend also thought I should read it so I could tell her what happens before we watched it!) Then for some reason I dug out my old copies of the Norton Anthology of English Literature and the first volume fell open at Christopher Marlowe who was writing just before Shakespeare. I had seen part of his life-story told in a lovely short film called Vadum Profundum, (a film about historical figures in Deptford) so I decided fate had intervened and I caught up with a couple of pieces that he had written, so now I'm slightly less ignorant of his work! The cinematic version of Kenneth Branagh's version of the Winter's Tale was fantastic. I haven't watched Kenneth Branagh for quite some time and I had forgotten what an incredible actor he is. He doesn't need to over dramatise, and I appreciate that more. Shakespeare can be kept "real", it doesn't need unnecessary flouncing about the stage and overly enunciated words. Speak honestly and the text does all the hard work for the actor. So quick rundown on the story for those who have not read it... King Leontes of Sicilia and King Polixenes of Bohemia have been life long friends. Leontes begs his friend to stay a while longer but Polixenes says he should go home. Hermione (Leontes' wife) begs Polixenes to stay, and he relents. Leontes however sees the camaraderie between the two and suspects that the child Hermione is carrying must belong to Polixenes rather then him! Rather than having a chat with them both, he orders a servant to poison Polixenes. This plan however is thwarted because the servant runs away to Bohemia with Polixenes instead! Leontes is furious and has his wife put in prison for her treachery, where she gives birth to a girl. Leontes requires the advice of the Oracle to decide whether his wife is guilty or not and when the Oracle declares that she is innocent and that the King will not have an heir, the King tears up the findings in disbelief as he has a son so the Oracle must be wrong. A servant then advises the son has died due to being so distraught over his mother being in prison, and it is not long before Hermione also dies of grief! The baby is taken away and left for a shepherd to find and bring up as his own. Sixteen years suddenly fly by and the girl, Perdita, has grown up and fallen in love with Polixenes' son! Polixenes finds out and is non too happy and orders them apart. This being Shakespare they decide a better option is to take a boat to Sicilia, so they do that instead. Leontes soon realises Perdita is his daughter and decides to take her to see a statue of her mother which is very life like, so life like it indeed comes to life and everyone lives happy ever after!!! It is a tragic fairy-tale, and the set lends itself well to the story. Branagh had set the play at Christmas, so the first few lines are not in the original play, it is the son choosing and opening a Christmas present which leads us into the tale, but this worked well and set the correct atmosphere of fun and friendship, before Leontes jealousy creeps in to ruin matters. The story shows a man who has everything, but throws it all away. Branagh is commanding in this tale, sometimes you are angry at his stupidity, other times sorry for him as he begins to realise his mistake and tries to seek atonement. It shows just how fragile time is, and how we should not throw time away, because you can never get that time back. Whilst this may sound rather gloomy, there were interludes of comic fun that just raised the spirits and gave the audience time to regather their thoughts and opinions of the main characters. A highly enjoyable evening and I'm so thankful that our local theatre plays these cinema streams from London, otherwise I would miss out on some spectacular performances. So there we go, the end to a very strange but enlightening year for me is a psychopathic Dolokov! I started the year knowing that I was to be made redundant (what a lovely 2014 Christmas present RBS!) Most colleagues were upset by this but really this was probably the kick up the backside I needed in life. Whilst trying to close the office down I figured I would have to try and read War & Peace before it came on TV, and that as it was going to take forever to read I'd better start sooner rather than later. I researched what translation would be the closest to Tolstoy's original and started reading, three weeks later I had finished and realised that it was a wonderful story and nothing to be scared of. I also realised that this was only February and by the time it was on TV I would have forgotten what goes on...and I have! During January, February and March the BBC kept messing about with The Musketeers scheduling. This made me a bit grumpy and so emails were sent to various loons who didn't seem to pay much attention, therefore I got the quill and ink out and sent very grumpy letters to the BBC which seemed to hit the mark! I had to take all of my holidays before I got kicked out of work in May, and so took the opportunity to start going back to the theatre. I took trips out to New Brighton on my own and realised how much fun you can have when you stop for a minute and start doing the things that you want to do, rather than the things that those around you expect you to do. Apparently it is weird to go to the theatre on your own, I dispute this now, and if no-one wants to watch what I want to, yes I go on my own and boy does that feel good! 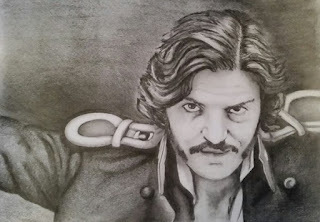 April was the month of change...I visited the Burketeers of the North-East! What a fabulous day that was, finally meeting up with some faces I had tweeted to. I didn't realise then that these people would soon become such loyal and loving friends, nor the fun-filled adventures that lay ahead of me. We got new nicknames by mistake, and to Cheryl's husband, us Burketeers will always be his Tinkers! This was also the month that I said goodbye to a very dear friend. I started work with a girl named Vicky when I was 17, and this friendship remained throughout university, even though she was in Birmingham and I in Preston. She remained in Birmingham and so I would visit for drunken nights out until she got married and had children! I didn't even know she was ill, she was told she had cancer and had a few months to live, turned out it was more like a couple of weeks. It goes to show you don't know what is around the corner; she was only 41 and had the world at her feet and so that should be a salutary lesson to us all to not bother waiting for tomorrow, live for today. It turned out that the move to the remaining office was not going well, what a surprise! The Bank in its infinite wisdom had decided to close the branch where the staff knew what they doing and what the various nuances of different types of Trusts were. They kept the office where they held one type of Trust and had a large turnover of staff, and therefore very little experience - really what could go wrong? Everything apparently, so just as I thought I would be leaving the Bank I was asked if I would mind staying on with a couple of other colleagues for a few weeks! Oh and would I mind going to the other office to sort it out? Yes I would I'm supposed to be heading out to Prague and starting a new life! In a huff I went to the other office, told a few home truths, got out whilst the going was good and flew out to Prague for a fun week on my own. There I made a new friend, and yes you guessed it she was a Burketeer! That was when I decided I should start writing a blog about my new forthcoming adventures! I came home, learnt how to set a blog up and the rest is history. As was the visits to the other office, for some reason they didn't want to see me again and they decided I was right; it was far easier to send work up to me rather having me sitting in their office telling them everything that they were doing wrong! June ends, so does my role of being a disillusioned manager and I decide to tackle those things which I used to find fun but had somehow forgotten. I dusted off my sewing machine and started making clothes again, and because I had time, I spent a lot of it on Twitter! Far too much time really, still it got me talking to people, and boy I am good at talking...but not Tweeting it seemed. I found it difficult "talking" to anyone I'd not met. Fortunately Tom rode to the rescue and announced he would be doing London Comic Con in July! Yay, the Burketeers I'd met in April got in touch and so we booked a hotel and we started on a new chapter in life which I shall call Burketeer Adventures! Somehow I arranged to meet a Burketeer who liked shoes...I like shoes so we went to the V&A to look at posh ones...although it was the grubby musketeer boots that made us squeal and nearly get kicked out. Here is a new friend for life I thought, and as it turned out Nikki's family lived down the road from me, so yes when she heads north she has to say "hi" to me now! Summer continued with me wondering if I should look for a job but I was still "finding myself" - well that's my excuse - so went off on little jaunts instead, this brought me into October and another trip to Prague, because when I came back from Prague I was definitely going to look for a job. Desperate to see if Athos was at home I broke into Pinon, fortunately I didn't get arrested by the strange drunk man that was lurking in the shadows, nor did my Czech friend disown me, neither did I find any inspiration over there as to what career path I should follow. I came home to find that I had to get my act together, we were doing a Christmas card for Tom and submissions were now due. I had two weeks to write a poem. So I did! It's not going to win awards but it was words on paper and slightly better than just writing "Happy Christmas love the deranged individual who just talked at you in London". So November dawns and so does the news that Tom is subjecting himself to another onslaught, but this time he's heading north...to Newcastle. That's just as much travelling as going to London but fortunately Cheryl offered me a bed at her home and I took it before she could change her mind! Several of the old crew turned up to stay, and two new faces, I say new, we met in London but hadn't really talked there. Yet again I burbled on at poor Tom when I met him as though he were some long lost friend, it was only when I saw the pictures later that I realised how traumatised his poor face looked. Oh well, never mind Mr B, take heart this is where me and Angie became proper friends so some good came out of the day! Then we hit December, another meeting with Tom, and more trauma on his poor face as I tell him off for advising me to read books with more than one syllable! There were more adventures with my Burketeer buddies which brought tears of mirth to our faces as we travelled from one escapade to another. Christmas Carols also meant meeting more new Burketeer faces and striking up some more wonderful friendships! And so endeth the year with a curry, a cuppa and a good book and not with an almighty drunken party! I hate New Year in that respect. Drunken eejits think it is acceptable to smother you in over-sized bear hugs and snog you! It's not acceptable...at New Year or anytime thank you very much. You think...if you think at all...that you are big and clever for invading someone's personal space. You're not, you're just rude, and you probably have beery, garlic breath too! To the Burketeers, I raise a glass to you all, may we continue to have fun, and of course to Tom (Polly has told him to read this drivel, I doubt he will but just in case) thank you for your patience and bearing with me. And on that note, Happy New Year one and all, hope you have a prosperous and successful 2016, it has been a joy making such new friends.